It is projected that there would be a huge demand for technologies for Palm Biomass treatment and their applications due to huge economic benefits generated and proactive government policies to turn bio waste into wealth. Each of the following Transfer of Technology (TOT) options we offer has its own set of opportunities and potential growth contributing towards business return on investment and growth of the industry, heading towards a more sustainable development and better environment. As an added benefit to investors, GGS offers a BUY BACK* option to new establishments (customers) so that the new investors do not have to go through the hassle of creating new marketing strategies to penetrate new markets. We are one of the pioneers in Biomass Industry and we offer Integrated Biomass Solutions from Consultation, Design, Machine Fabrication, Logistics to Training, Installation and Local Technical Support. In Malaysia, more than 168 million tonnes of biomass is generated yearly from oil palm wastes, rice husks, municipal wastes, sugar cane, etc. The availability of this massive amount of bio-waste and current emphasis on turning wastes into useful products is giving a huge boost to the biomass sector. With a strong demand for waste solutions, it is inevitable that this industry is booming with bright future. GGS believes that synergizing is a process of creative cooperation. It is teamwork, open-mindedness and the adventure of finding new solutions to old problems. The issue on global warming could best be mitigated through green efforts within the industry. 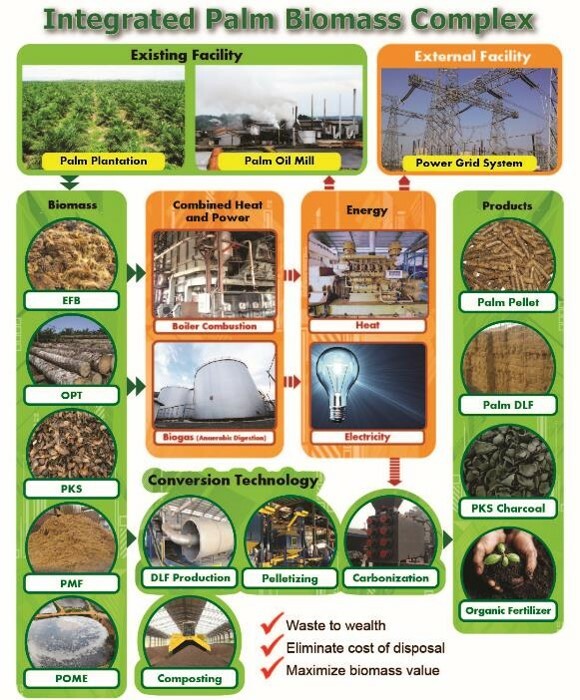 With more than 400 palm oil mills in Malaysia, the world’s second largest producer of Crude Palm Oil (CPO), Malaysia has the potential to become a hub for biomass industry. As Malaysia is the world’s second largest palm oil producer, the wastes produced from palm oil mills are aplenty. These include empty fruit bunches (EFB), mesocarp fiber (MF), palm kernel cake (PKC), sludge cake (SC), palm kernel shell (PKS) and palm oil mill effluent (POME). But the oil palm biomass can be converted into value-added products such as dried long fibers, composts, briquettes and pellets. Today, commercial biomass sector is an emerging economic movement that helps Malaysia to generate a sustainable business environment. It provides a significant financial saving on pricey fossil fuels, as well as fulfilling the government's green mandates. If you have a huge amount of wastes, how would you manage them? Come and see us. Global Green Synergy (GGS) is able to provide the solutions for biomass treatments and conversions by providing consultation on how to achieve the maximum benefits from this business as well as protecting the environment. 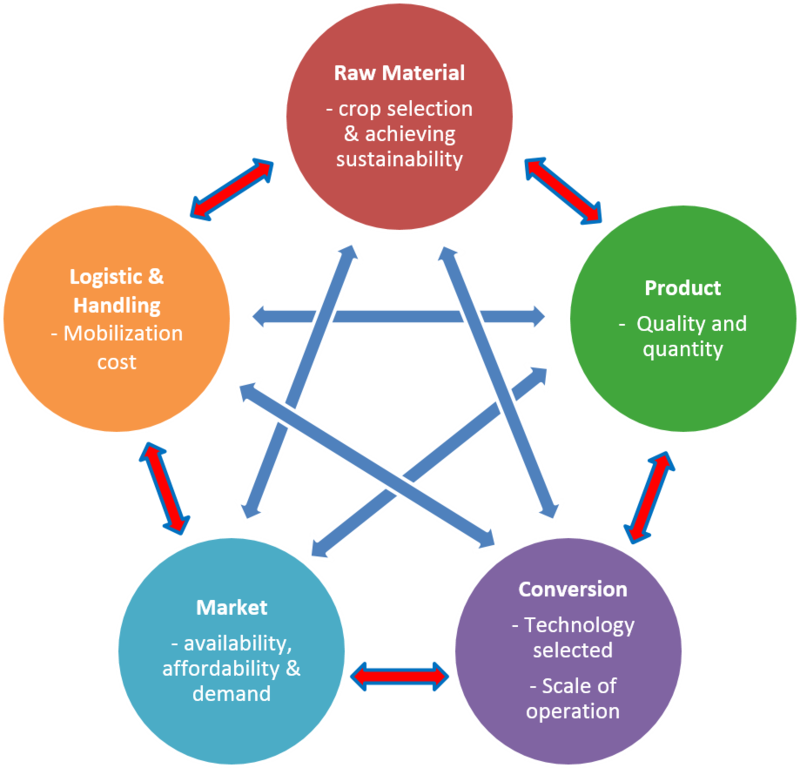 Palm oil supply chain analysis and optimization in clusters of palm oil mills, transportation management, location of collection centre, palm oil mill, biomass complex, storage, etc.